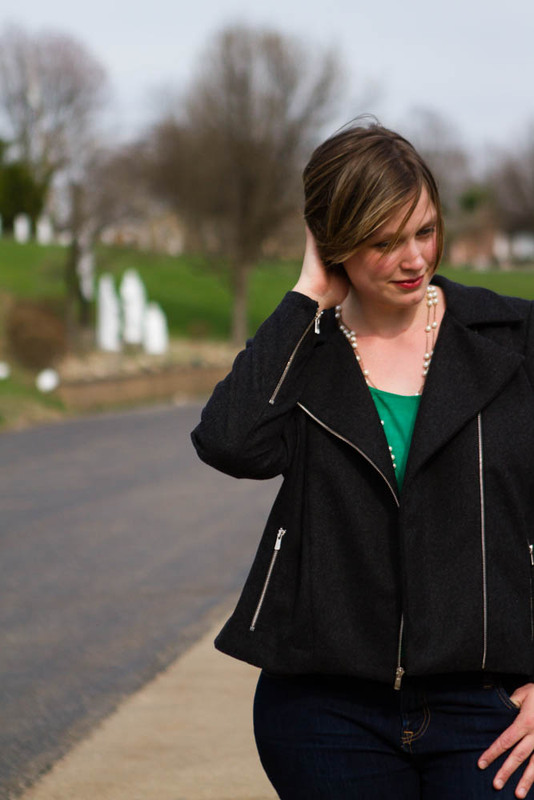 I love when I can conceive of, plan, and make a project all in one day. This was one of those projects. The kids have been driving me crazy with the precarious placement of the cups – especially as little Gianna graduates into a “big girl cup”. They did not understanding that cups should be placed ABOVE their plate, not in front of it. So I came up with this idea to show them everything has a proper place at the table. 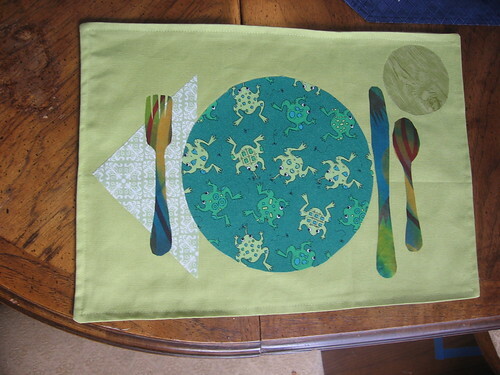 The place mats were super easy to make, the place setting appliques less so. 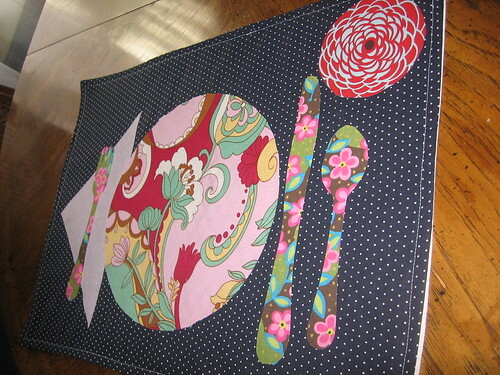 The finished measurements are 13″x18″ (14×19 before sewing) . I used home dec fabric for the green one and quilting cotton for the navy blue. The quilting cotton wasn’t heavy enough so I sandwiched a piece of sew-in interfacing. 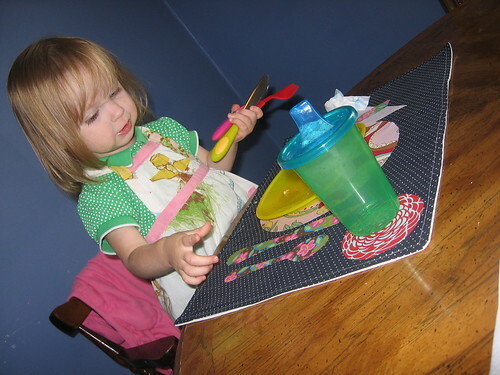 Then I traced around a cup, a small plate, a set of silverware, and a triangle for the napkin onto the paper backing of the new-sew adhesive. Cut out shapes. Iron onto fabric scraps. Cut out fabric. 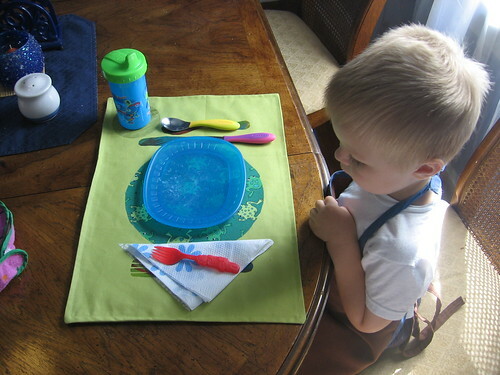 Peel off paper backing and iron onto placemats. I am worried how the applique will hold up. It seems like it might be peeling already. The kids like to pick at it. So I will probably have to run some stitch around the edge to make it last through the wash. The kids LOVE them. I love them. Andy loves them. So I will probably make more. When I do, I’ll take pictures for a little tutorial. UPDATE: The iron on adhesive isn’t holding up. I had to sew them down. THESE ARE THE COOLEST THINGS I HAVE EVER SEEN!! I LOVE them! I love them and I am making them myself now although mine will not look any where near as nice as yours the girls are excited about them. I have seen them made before on Montessori blogs but never had the courage to try till I saw the picture of you sewing with all your kids around you!!! I also bought and dyed silks (which I have been wanting for a while but were out of budget) Thanks for all the inspiration….you are soooo talented!! I’m glad you have been getting the courage to try it out! Let me know how it goes and feel free to call with any questions!